When comparing to other retailers, Americus ranks near the top. Their store is a sight to behold. It truly is an experience to be in that store and their selection is fantastic. Their prices are high compared to an online jeweler like James Allen or Blue Nile. But so long as you are providing a value added experience for that premium, it is a reasonable choice for consumers to make. I feel that Americus is offering that in spades. I have to hand it to Americus. Their store is a spectacle. I know everything’s bigger in Texas, but Americus is Texas size on steroids. Unfortunately we were not allowed to take pictures, so I will have to describe the place. As you can see from our lone photo outside (they don’t allow photos inside), the store is four stories high. But there is only one floor. The ceilings are so far above you, you can’t even see them. 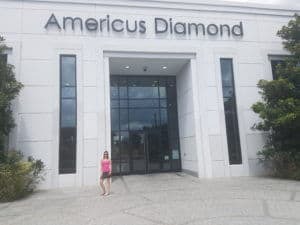 Americus is the largest diamond store in the United States, at 24,000 square feet. Walking in, the store is elegant simplicity at its finest. There are multiple long rows of display cases and they are chock full of engagement rings. You have rows divided by ring type (solitaire, halo etc) and then specific cases for each shape. Their lighting is absolutely perfect and the rings sparkle their hello as you walk by. We were quickly approached by a salesperson. She was very friendly and eager to help. She expertly guided us to the cases we wanted and talked us through the process. We settled on round diamonds in solitaire settings and she showed us a nice range of products to help narrow things down. Americus has a vast inventory, both of settings and diamonds. Pretty much any combination you want can easily be found. I overheard another salesperson mention that they don’t have many platinum settings, but you can custom order those no problem. We had the opportunity to secret shop Americus two times. It was nice for us to see that Americus self corrected one of the biggest issues we found on our first visit. The first time we visited the store, they salesperson showed us a 0.70ct “E VS2” (we’ll get to the quotation marks in a minute) for $3,780. They had this diamond mounted in a simple 14kt white gold solitaire setting that cost $440. The reason for the quotation marks is the certification. When asked, the salesperson said that all diamonds are certified by the most respected labs; GIA or EGL. EGL is not on the same level as GIA. Based on our experience, they aren’t in the same ballpark. I was stunned that the diamond we were looking at was called an E color. That is what prompted me to ask what the certification was. Don’t get me wrong, the diamond was a nice diamond. But the diamond did not look like an E color to me. Had they called it what it was (I couldn’t inspect it properly, but it was probably a G color in my opinion), I wouldn’t have blinked an eye. But it’s important that you know exactly what you are buying. That is the whole point of buying a diamond with a certificate. A certificate allows you to compare apples to apples and be comfortable you are paying a fair price. The second time around was a different story. We were only shown GIA certified diamonds. I spoke with the owner of Americus and found out they stopped buying EGL diamonds a few years ago. It takes some time to get rid of their old inventory, but they only buy diamonds with top level certification now. We were shown two diamonds during our second visit. The first was a GIA certified 1ct J VS1 that was gorgeously cut for $6,897. We couldn’t take pictures there, but the diamond was stunning. The second diamonds was also very nice. It was a 1.09 H VVS1 that was stunningly cut for $8,809. Both diamonds were absolutely fantastic. One thing that stuck in my craw a bit was the way they used an ugly diamond to scare people away from buying a diamond on-line. They pull out a diamond that is downright horrific and say “this is what you may end up with buying on-line”. The superficial grades on GIA look fine, but there is a note on the certificate “Clarity grade based on cloud not shown” which means their is a huge cloud in the diamond which completely deadens any brilliance. To me, doing something like this is completely unnecessary and beneath Americus. While it is true that you can get a bad diamond online, that is in many ways irrelevant. You can get a bad diamond in a physical retailer as well. With any education and guidance (which is something we work very hard to offer) you would be able to easily avoid issues like that both on-line and in person. Even the customer service at the well regarded online sites would steer you clear of a diamond like that. I wish Americus would just throw that diamond in the garbage. They have fantastic diamonds, amazing setting selections and an overwhelming customer experience going for them. Why get into something like this? We will focus on the diamonds we saw during our second visit. Lets start with the J VS1. Here is a stunning 1.02ct J VS1 from James Allen for $5,490. It is a gorgeous diamond for $1,400 cheaper (about 20% cheaper). For the second diamond, we’ll compare it to this H VVS1 from Blue Nile that is virtually identical in characteristic for $6,665. This would be a savings of $2,245 (a savings of 24%). Are the diamonds on-line cheaper? Yes, of course they are. An online retailer does not have anywhere close to the same overhead and operating expenses that a physical retailer has. But as far as physical retailers go, these diamonds were as close to competitive as we have seen. The real question to ask yourself is whether you are getting something for the premium they charge. It is rare that I say this, but I believe the answer is yes when it comes to Americus. They offer a truly unique experience and are well regarded within their community. That is truly rare in our experience. Whether that is enough for you to justify spending the extra cash is a question only you can answer.